In the midst of calls for protectionism and global economic developments, ASEAN stands ready to respond to issues affecting trade and investment, drawing strength from its integrated economies. 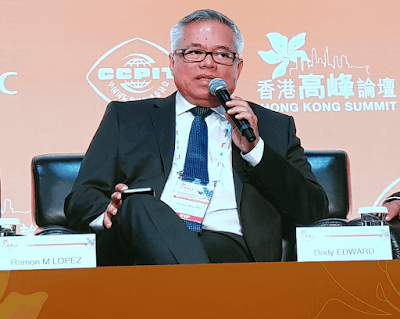 Speaking at the Hong-Kong East Asia Summit on 11 July, ASEAN Economic Ministers chairman and Philippine Trade Secretary Ramon Lopez discussed current integration efforts in ASEAN and how these would eventually translate to regional complementation. “Each economy will be differentiating its products to complement those of other economies. Economies may not necessarily compete, but they may complement each other through product specialization and market segmentation,” explained Sec. Lopez. The trade chief emphasized that regional integration has resulted to a wider array and selection of products and services offered to ASEAN consumers. “Regional integration will end up to regional complementation. ASEAN can lead the way and believes in the benefits of regional collaboration. It may work slowly but surely,” he said. “ASEAN shows how integration becomes plausible despite differences in background, culture and stages of development. With all these, we believe there is unity in diversity,” Sec. Lopez added. As one of the fastest growing regions, ASEAN is the 7th largest economy in the world with a population of over 622 million people. It is also a marketplace with a relatively young, growing labor force and an emerging middle class. On the benefits of economic integration, Sec. Lopez said that the ASEAN Economic Community (AEC) affords ASEAN a bigger role and a more prominent voice in dealing with fellow global economic players. According to him, with the AEC, the region’s connectedness combined with its diversity becomes strength as the variety in ASEAN pulls investors in, mindful of the region’s stake in open global markets. The ASEAN Community 2025 Blueprint guides ASEAN with measures to address emerging challenges and to attain region-wide inclusive growth. Sec. Lopez recognized the role played by the micro, small, and medium enterprises (MSMEs) in the region’s integration efforts. According to him, to attain inclusive economic growth that leads to shared prosperity, MSMEs need to take on a stronger role in boosting the region’s economies as creators of wealth and providers of jobs and livelihoods for the people. He added that by heightening innovation, technology research, and human resource development, ASEAN MSMEs can also move up the global value chains. “The big challenge really is how big companies can integrate MSMEs in their value chains—to empower them and make them more competitive and part of the equation, because it is only then we can really talk about inclusive growth,” he said. The trade chief also cited need for MSMEs to embrace the digital economy through e-commerce, which provides an innovative platform to market, sell and research. In this respect, technology becomes an equalizer. Citing US’ withdrawal from the Trans-Pacific Partnership and the Brexit, Sec. Lopez reiterated the benefits of substantially concluding the ASEAN-led Regional Comprehensive Economic Partnership (RCEP) agreement by end of 2017. “The ASEAN-Hong Kong FTA definitely will be a major FTA, too that will allow us to use Hong Kong as gateway to China. This will be a huge benefit for ASEAN,” he said. The ASEAN-Hong Kong Free Trade Agreement and the ASEAN-Hong Kong Investment Agreement are expected to be signed in November 2017 in Manila.